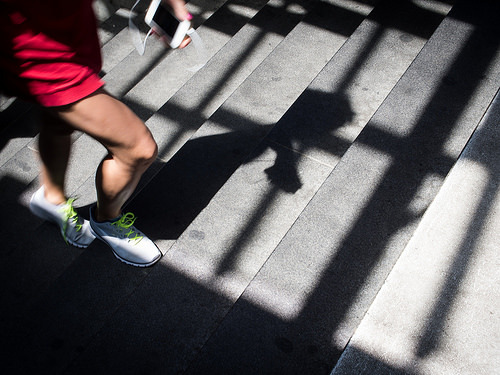 If you are looking to lose weight, running stairs might be a great way to reach your goal. It takes a lot of work to drop those pounds. For every pound you want to drop, you have to burn about 3,500 calories more than you eat. The activity is an inexpensive way to meet your goal, with no special equipment needed except a good set of stairs. It has added benefits like improving your respiratory and cardiovascular health. Calories burned running stairs are determined by the intensity of your exercising and how long you perform it. Will you be walking up and down your office stairs or running up and down stadiums? This is something you have to consider. How Many Calories Are Burned When Running Stairs? The first step to figuring out calories burned running stairs is to determine your desired intensity. If you are thinking about quickly climbing stairs, you will burn the same amount of calories as jogging or cycling at a moderate pace. If you plan on running up stairs, you can burn as many calories as running 5 minute miles or bicycle racing. Running stairs can be a challenging exercise. However, by adding it to your schedule, you will reap a lot of benefits like improved cardiovascular health, increased respiratory function, weight loss and toned physique. You can burn more calories running stairs than many other activities. Since it is recommended you complete 30 to 60 minutes of physical activity four or five days a week, consider breaking up your activity into 20 to 30 minute increments. This means when you run stairs you should do so for about 20 minutes at a time and/or do other activities for the rest of the recommended time. Use a stopwatch to record how many times you run up and down the stairs or how many stairs you run in 60 seconds. As you get better at the activity, try and beat your record. For example, if you can run up 20 stairs in one minute, then go for 21 the next time and so forth. Consider doing interval training by varying the intensity while you exercise. When considering calories burned running stairs, you can increase your workout by alternating between a slow and fast pace. For example, you can walk down the stairs and then sprint up. If you add resistance training, you can build faster muscle and tone your legs. When you intensify your workout, your muscle will burn calories even as you sleep. Consider adding a weighted vest or holding an exercise ball. However, always walk down the stairs to avoid hurting yourself due to the greater impact on your feet and knees. Always speak to your doctor before starting a weight loss plan and exercise routine. Plan your workout around times your chosen staircase or stadium is not busy so you have less chance of running into someone. When you are climbing or running up stairs, think about power. You want to focus on taking each step as though you were stepping off to dunk a ball. Extend your leg and place your foot solidly on the top of the step. Creating greater force will make your body create more power. To avoid knee, shin, hip, back and hamstring problems later down the line, pull your toes inward towards your shin on the leading leg. Try to keep the weight of your landing on the ball of your foot. Push through your leg to distribute the impact. Often, it is the trip down the stairs when injury occurs. This is because people have the tendency to put all the pressure on their knees instead of their glutes. Your body creates a lot of force when your body drops one or two steps. Add in gravity and the impact is considerable. Over time, this can wear down your muscles and leave you open to injury. Body alignment is important when going down stairs. Make sure your knee is aligned with your second toe. Sway your hip out to the side instead of pushing it behind you. If this is hard for you at first, utilize the hand rail to control your movements. If you do hurt yourself, help yourself recover. Minimize pains by massaging your trigger points. Use a foam roll and work your way down from your hip bone through the side of your thigh and to the front of it. Use the roll, or even a massage stick, to start at the back of your hip and work your way down to the outside of your knee.